Did I mention I love MakeZine? 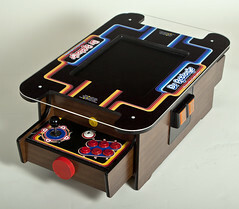 Every now and then, they come up with some cool design involving MAME arcade emulator, some sort of retrogaming machine and, of course, a lot of DIY assembly. Sam built a tabletop arcade-alike that’s amazing, and shared with us all the arcade building details in a Flickr set! This entry was posted in DIY, Hacking, Hardware, Retrogaming, Videogames and tagged Mame, Retrogaming, tabletop arcade, video games. Bookmark the permalink.